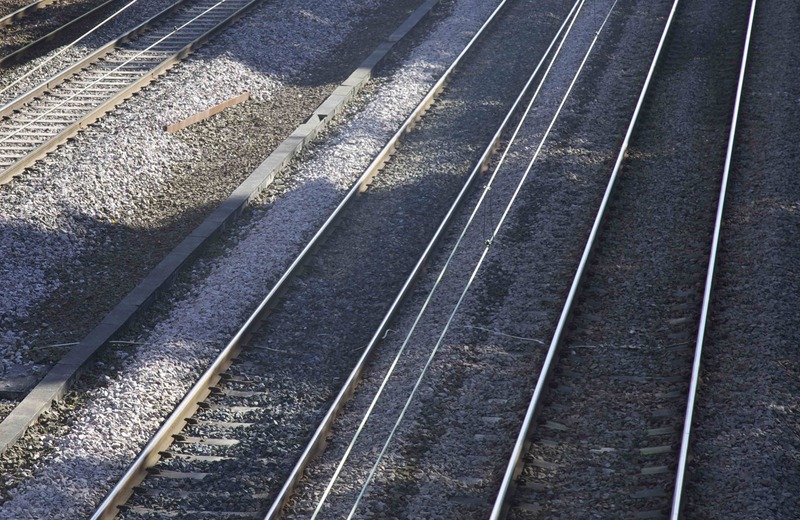 According to Walter Benjamin, railway tracks had a ‘peculiar and unmistakeable dream world’ attached to them, one that, for early railway travellers, was related to their unprecedented straightness in the landscape, their geometric alignment, or in their wider convergence into networks. Early railway prints in the 1830s and 1840s (1) emphasized the sharp linearity of railway tracks, cutting through the landscape with unprecedented geometric precision; while contemporaneous travellers were transfixed by the seemingly infinite recession of parallel tracks. 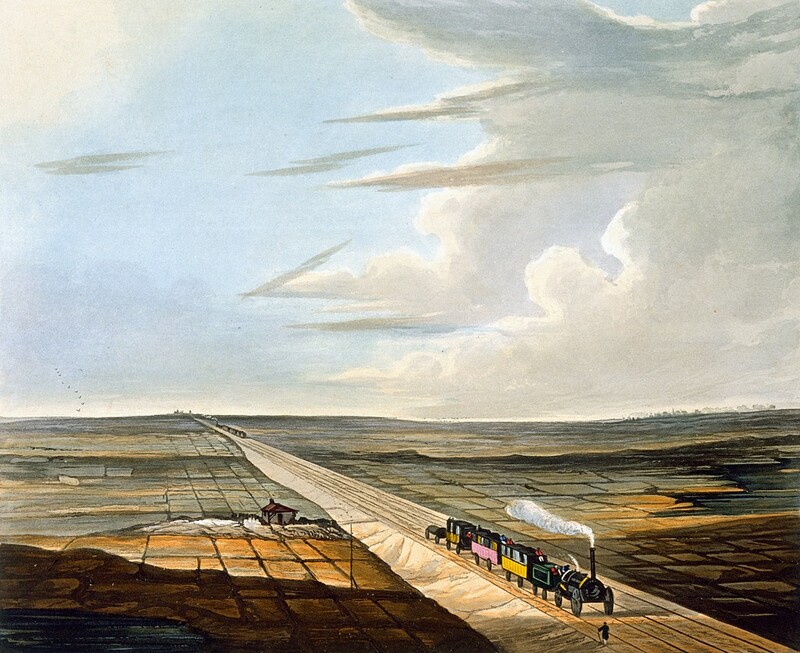 As recorded by Edward Stanley in 1830, when he witnessed a locomotive approaching from the far distance, train tracks seemed to compress space and time and usher in a new form of perception; Stanley thought the parallel tracks made the engine seem to increase in size ‘beyond all limit’ as it came nearer, eventually ‘absorbing everything within its vortex’. A similar fascination came at the end of nineteenth century, when railway tracks formed some of the earliest subjects for film: that is, in the ‘phantom ride’ (2), a term used to mean a film that looks from the front of a moving railway engine along the tracks themselves. Here, the novel view of the camera (one that was seldom experienced in ordinary life) combined its ‘subjective’ view with an inaccessible position that laid bare, through an unwavering emphasis on the endless perspective of the parallel tracks, the disembodied consciousness of the railway journey. If railway tracks suggested a new kind of machine aesthetic, defined by extreme linearity and a corresponding overturning of ‘natural’ perception, then the conglomeration of tracks into networks seemed to produce revolutionary new patterns – or ‘meta-ornament’ in the landscape. 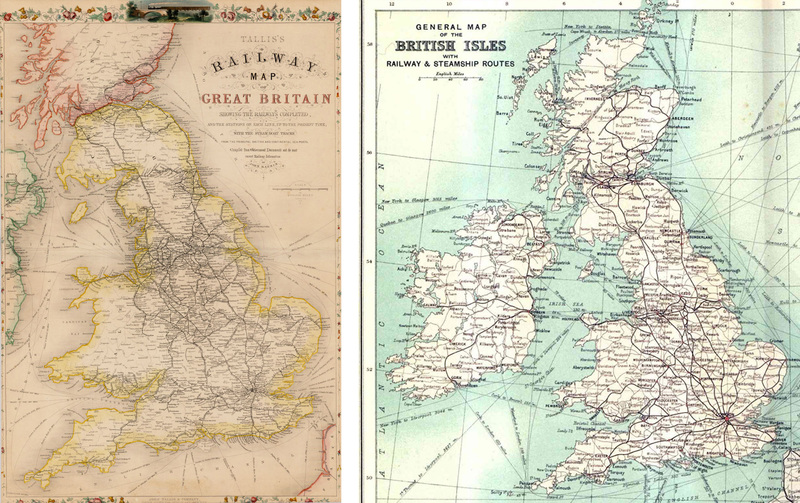 In its early decades, the new railways spread at a seemingly exponential rate across Britain, from just under 100 miles of track in 1830 to over 6,000 by 1850 (3; left), rising to 19,000 by 1900 (3; right). Yet, their growth was far from ordered, the consequence of unregulated competition among private railway companies, and for some, the resulting network was perceived as alarmingly chaotic. 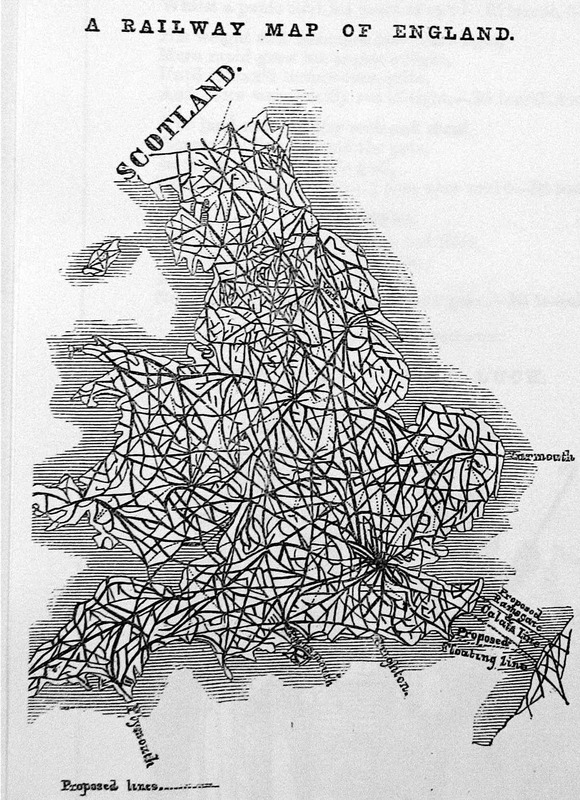 Punch pictured its own ‘Railway map of England’ in 1845 (4), at the height of railway speculation in that decade, with the English landscape of the near future enmeshed ‘in irons’, with no ordering principle to the layout. Left unregulated, the railway companies would, Punch argued, eventually create so many tracks that ‘we shall soon be unable to go anywhere without crossing the line’. For others, the speed at which the railway network spread across the country was nothing short of miraculous: The Builder arguing in 1852 that the railways were ‘preparing the world for a wondrous future’ when they would unite the whole of humanity ‘as one great family’. Later, when a new railway was constructed between Buxton and Bakewell in 1876, The Builder argued that the iron tracks enhanced the picturesque landscape through which they passed by adding a ‘new element of what may be called the mental or moral picturesque’. In contrast to John Ruskin, who bitterly opposed the building of the new line, The Builder perceived ‘a kind of mystery’ in the track’s ‘windings and burrowings’ through the soft landscape which, taken as a whole, were strongly suggestive of the ‘bond of civilization that connects us’. If Ruskin lamented the railway’s tendency to obliterate beloved landscapes and their traditional cultural forms in its gigantic network of lines, The Builder had the opposite reaction: railway tracks became picturesque precisely because of their connectivity, that is, the way in which they created, through ‘the triumph of science’, new geographic and social networks that had a high moral purpose.